This is a well-known problem in Puppy. It stems from the fact that .debs (from Debian or Ubuntu) are designed to set-up permissions for a multi-user system. 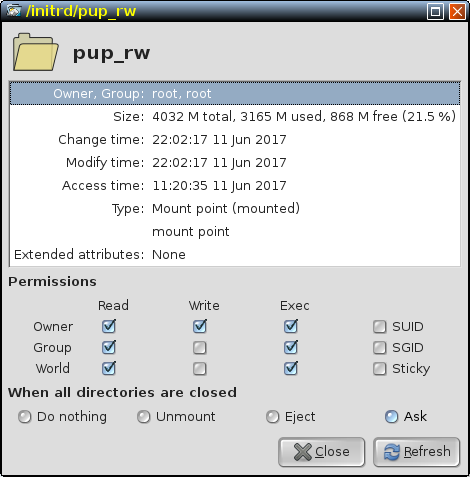 Puppy is not a multi-user system; it is specifically designed to be a single-user system, so the user has full access to their system. If your execute permissions are not as in the image, tick/untick the checkboxes until they are. Then 'Refresh'. Finally, 'Close'. Hopefully, this should fix it for you. After re-booting, obviously, check to ensure printing is now working as it should. These will work on Tahr64 (and derivatives), and Slacko64 (and derivatives). Like peebee, I'm only going to concentrate on SFS packages for these. The same converter that will work on his Chromium releases to turn them into .pets should work on these, too. Here's the link for the 'Google Chrome browser' folder on my Google Drive a/c. Access it, and download the one you want. Enjoy! Any problems, let me know as usual. If you are looking for another good platform for Chrome, take a look at Debian Dog 64. Main advantage is that you can install it straight off the Chrome website and it automatically adds the repository so that you can keep it updated via apt-get like any other application. You can then run it as root with a simple script. I did an explanation of how to do it, I'll add the link as soon as I find it. Thanks for the link.....and the info. I've found pretty much as OscarTalks has; that the only way to get it to run in most Puppies is to disable pretty much all the sandboxing. I've incorporated this all into the 'google-chrome' wrapper script in /opt/google/chrome. Curiously enough, I did find out during testing that the current-chrome-stable .deb will install, and run, pretty much 'as is' in Tahrpup64.....but not in any of the others. You do have to add the '--no-sandbox' switch to the exec statement at the end, but pretty much everything else can be left alone.....with the exception of removing one or two stanzas from the wrapper-script that aren't necessary for it to run in Puppy, and which if left, actually confuse the issue. I might have a look at DebianDog one of these days. This is the one where the Debian LiveCD has been modified to behave like Puppy, isn't it? If I was 'mean-spirited', I'd just do what I needed to do on my own hardware, and say 'To hell with everybody else'. But I'm not; I like to share stuff, for the good of all. It's just the way I'm wired-up, I guess! It looks to me like your desktop script is using the exec statement that normally occupies the tail end of the wrapper script anyway; the difference being that yours calls the 'google-chrome-stable' entry in /usr/bin (which then links, via a 'relative' link to the wrapper-script, which in turn then calls the chrome executable), whereas the exec statement in both Oscar's and my version of the wrapper-script calls the chrome executable directly. This is one of the things that I love about Linux; there's so many different ways of making the same thing happen! You've achieved the same result, just via a more roundabout route. Still works though, doesn't it? Mind you, if you open up both /usr/bin/google-chrome-stable and /opt/google/chrome/google-chrome with Geany, they both show the same identical script anyway, so.....I wouldn't like to say! I have actually packaged the .pets for it, but decided not to release them, and concentrate on the SFS packages instead (like peebee has), since they're more versatile, and you don't have to leave them loaded all the time if you don't want to. Yes, Debian Dog is the Debian Live CD modified to act like puppy. It is more than that, but in one sentence that is a pretty good description. I didn't want to modify anything that might get overwritten by an upgrade. That's the main reason I used a separate script rather than edit the wrapper script. Before, when I have put Chrome in Lupu and Precise, I would just edit the exec line in the .desktop file. That works too. Whenever you want to try Debian Dog, pm me and I'll upload my remastered main sfs file for you to try. Sorry for just now; I was editing my reply while you posted yours..! Apologies. BTW; you mention about running Chrome in Lupu. Out of curiosity, what's the newest version of Chrome you were able to get running in it? I only ask because I was helping TwoPuppies out the other day, and installed Lupu to do so. I'm glad I did; despite using quite an elderly version of the glibc, it runs like greased lightning.....it's quite an eye-opener. I run, amongst other things, Photoshop CS2 under WINE on it, and, no word of a lie, it actually runs faster than it ever did in Win XP..! The version in Lupu is very old. I don't have it installed anymore. I am on my remastered version of Precise right now. It has Chrome Version 25.0.1364.160. So substantially older than that. If you really want to know, I could install my Lupu remaster on a USB stick and check, but the answer will be "really old." TwoPuppies let me have a copy of his Chrome 26; it's the latest that will run under the 2.11 glibc in Lupu. Works really well, too; despite not being able to access the App Store. You do know you can run Chrome 48 in Precise 5.7.1, don't you? I've been running it for quite a while now, along with the latest Iron browser, which is based on Chromium 50. I can let you have the links, if you're interested. Sure, give me the link. I won't do anything with it right now, but it might come in handy. It's available as both .pet & SFS. Like I said, I've been using it for quite some time now.....and if you ever get around to installing it, you'll want to bring PepperFlash up to as new as you can get it (which is Adobe's final 32-bit Pepper.....21.0.0.213). I'm posting this from Chrome 48 in Precise 571 right now. Hope you find them useful..! Re-worked and re-packaged the SFSs, to fix the small problem of no icon for the Menu entry. Link still the same as above. The current version, 52.0.2743.82 (with Pepper 22.0.0.209), released yesterday, is now available for download. Link as above in the first post. The current version, 52.0.2743.116 (with Pepper 22.0.0.209), released early yesterday, is now available for download. Enjoy, as always. Any probs, you know where to find me. The current version, 53.0.2785.92 (with Pepper 22.0.0.209), released yesterday, is now available for download. Attempting to use the previous set of switches now results in a spontaneous 'abort' of the process. Edit:- (1:20 am) Experimentation, and a rapid rework of the exec-line 'switches' in the 'google-chrome' wrapper script has restored almost 100 % sandbox functionality, I'm pleased to report..! Enjoy, as always. Any probs, let me know, although I don't anticipate any. I always make sfs for chrome to use in Fatdog64. Here is latest made yesterday. It uses Fatdog's "run as spot" script. The .desktop file in /usr/application is edited to point to google-chrome-spot. Other than that nothing is changed. I didn't check your sfs files as I primarily use fatdog only. And I may not be able to answer your questions about why I chmod sandbox or why I added those files or how the run as spot script works, because I don't know. I am too noob to understand that. I just saw fatdog chrome update and install script and replicated what it changes in to the directory where I extracted the .deb. Anyway please test it if you can. Or add to your mediafire link if you want, so that all files are at same link. exec /usr/bin/run-as-spot /opt/google/chrome/google-chrome --user-data-dir="$SPOT_HOME/.config/chrome" "$@"
exec su spot -s /bin/dash -c "cd \"$CWD\"; \"$APP\" $ARGS"
Yeah, we can do that if you want.....put the link for yours in my Mediafire account. I've been meaning to investigate setting it up as a 'run as spot' version, but, like you, I don't fully understand all the various permissions and stuff as yet! Interestingly, the modifications I made to the wrapper-script restore almost total sandbox functionality in the 64-bit version.....yet If I try to replicate this in the older, 32-bit versions (all the Pups on my old 32-bit Dell Inspiron (P4 and a gig of RAM) use Chrome 36.0.1985.143, 'cos it's sufficiently lightweight to run well, yet still retains access to the App store for now) it results in a total refusal to run at all. Obviously Google have made some changes in the Chrome binary in these newer versions that allows this different usage of the sandbox 'switches'. I'll add your link to the Chrome folder in my Mediafire a/c, and indicate it as a 'run-as-spot' version.....no probs with that, there's at least 10 GB of free space. It does make sense to keep stuff in the same location as far as is possible; this is one of the frequently heard 'moans' on the Forum, that there's no end of apps available, but they're so spread-out, across God-only-knows how many different accounts, that they're hard to track down. I'll have to try it out in Tahr64 & Slacko64 to see if it'll work with them. Leave it with me, and I'll post with details when it's all set up.